The U.S. Air Force Research Laboratories and Lockheed Martin have demonstrated a mixed formation of manned and unmanned F-16s in a simulated combat environment. The Have Raider demonstration at Edwards Air Force Base in California included two phases, Lockheed announced on April 10, 2017. The first phase, Have Raider I, focused on formation-flying. Have Raider II sent the pilotless F-16 on a mock bombing run through “dynamic” enemy defenses. “This demonstration is an important milestone in AFRL’s maturation of technologies needed to integrate manned and unmanned aircraft in a strike package,” Capt. Andrew Petry, an AFRL engineer, said in a Lockheed press release. Have Raider is an extension of the Loyal Wingman program, which AFRL launched in mid-2015, hoping to develop technologies that would enable autonomous fighters to accompany human pilots into combat. The unmanned jet could haul extra weaponry to bolster the manned plane’s firepower — or fly ahead of the manned jet to distract enemy defenses or absord some of their fire. “Autonomy technologies can enhance future operations and capabilities in contested and denied environments,” AFRL explained. The Loyal Wingman effort has gotten a big boost from the Air Force’s parallel efforts to develop old F-16s into remote-controlled target drones. 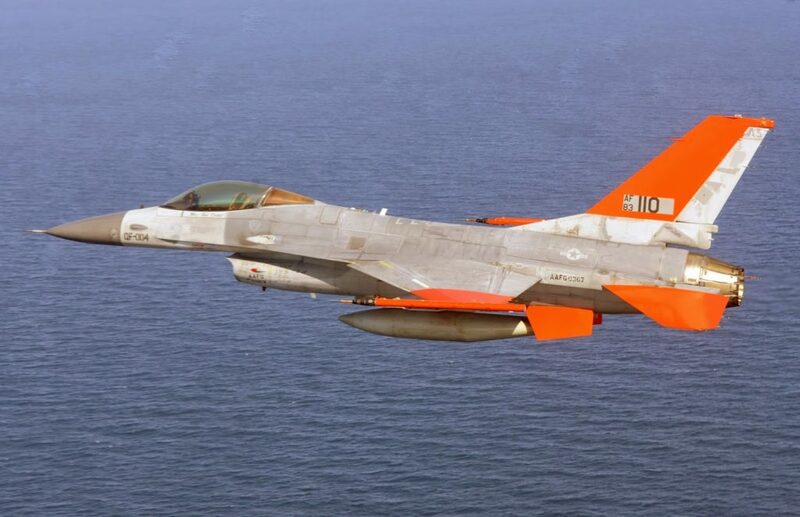 By simply replacing a few “line-replaceable unit” circuit boards, maintainers could covert a QF-16 drone into an unmanned combat air vehicle, or UCAV. In Have Raider I, an unmanned F-16 flew in formation with a manned F-16 and conducted a simulated ground-attack mission before automatically rejoining the lead aircraft. “These capabilities were linked with Lockheed Martin automatic collision avoidance systems to ensure safe, coordinated teaming between the F-16 and surrogate UCAV,” Lockheed stated. Have Raider II was more complex. According to Lockheed, the pilotless F-16 autonomously planned and executed its strike mission, reacting to unpredictable enemy air-defenses while also compensating for simulated damage to its own systems and total loss of communication with its human controller. The Loyal Wingman technology gives the human pilot in a mixed manned-unmanned section the ability to issue general commands to the pilotless plane — attack, join formation, etc. But the UCAV can hold formation without direct control and can carry out much of its ground-attack mission without any human input. It’s not clear who would authorize the UCAV to drop bombs or fire missiles. U.S. military policy dictates that a human operator authorize a drone to deploy weaponry. Presumably, the pilot in a manned-unmanned formation would be responsible for commanding his robot wingman to open fire. The ultimate goal of the Loyal Wingman initiative is to pair manned, fifth-generation stealth fighters with unmanned versions of older jets — in order to boost the lethality of both in air combat. But the Loyal Wingman concept could also work with other planes and drones — some already in service, others still on the drawing board. Cadets at the Air Force Academy in Colorado designed a stealthy target drone that could be compatible with the Loyal Wingman software. The Pentagon is also developing what it calls an “arsenal plane” — a B-1 or B-52 heavy bomber modified to launch weapons at targets designated by aircraft, potentially including UCAVs, flying ahead of the bomber. The same principles of manned-unmanned teaming underpinning the Loyal Wingman effort could apply to the arsenal-plane idea, too. And the Americans aren’t the only ones developing mixed, piloted and pilotless formations. The Japanese defense ministry’s Acquisition, Technology and Logistics Agency launched its own so-called “Combat Support Unmanned Aircraft” concept in 2016, aiming to eventually build a robotic wingman for the future F-3 manned fighter.